EVER TRIED A SPANISH SOUP? When you visit Spain, don’t stick only to tapas: get your spoon ready to try some authentic Spanish soup recipes. When someone thinks about Spanish food, tapas and paella seem to be like the only thing that’s worth trying. However, if anything characterizes the Spanish gastronomy in the cold months are warm and soupy dishes eaten with a spoon. Some are definitely soups and creams, while some other contain liquid enough to require a spoon to be eaten, hence we consider them “spoon” dishes. And they are a great to warm you up before continuing sightseeing or after a long day walking around the city! Every region has it’s own typical “spoon dish”, so there are options for all tastes: from the earthiest ones to the lighter. Today we’ll talk about the ones no visitor should miss: take note of the name of these Spanish soups and don’t hesitate to order them in your next winter trip to Spain. If you love vegetables and legumes you’ll love this option. It is a dish based on legumes (usually chickpeas, but sometimes lentiles or white beans) to which we add a vegetable styr-fry and stock. It must be soupy but not as liquid as a soup. Then every cook gives it their own personal touch with the addition of different veggies and meats such as chorizo, pork and some bones. By the way, the Spanish potaje has nothing to do with the French potage, except maybe that both words come from the Latin word pottus (pot) that eventually ended up referring not just to the container but also the content of it. In French, potage means any type of veggie soup, while the Spanish potage is, as you’ve seen now, is earthier, meatier and fattier (yet delicious). Garlic soup is a typical soup from the Castilla y León region (center of Spain, North of Madrid), and it’s traditionally eaten during Easter probably because it doesn’t include meat. This popular recipe of humble origins is made with water, old bread, paprika, bay leaf, garlic and oil, and often a poached egg is added. In the old times, it was commonly eaten by the working class half way through the morning as a pick-me-up, after a long night of hard work, or after participating in Easter processions carrying the heavy wooden religious sculptures down the streets, as it’d warm up their bodies and it’s easy to digest. It’s such a simple recipe that in Catalan when someone all of a sudden realizes something very obvious, we say “this one has just discovered garlic soup” (Aquest ha descobert la sopa d’all). Lentil soup with chorizo is a very tasty and nutritive dish that originated in Avila (also in Castilla y León), and soon expanded all over Spain. It is a very popular and simple recipe made of sauté lentils to which are added products from the pig slaughtering season (mostly boiled chorizo, but also blood sausage, bacon and bones) and some vegetables: tomato, carrots, onion and garlic. Bay leaf gives it a delicate herbal touch, and then pimentón (sweet paprika) is added to confer it its typical reddish color. You won’t be able to stop dipping bread on it, I promise! Also called Pescado Emblanco, if you are not a fan of earthy soups, then this lighter fish soup is likely to be what you are looking for. Originally from Andalusia (South of Spain), it is now cooked in many homes when someone has stomach ache – but don’t think it’s as bland as hospital food! It’s made with bites of white fish such as Kingclip or Rock Salmon, sliced potatoes, some vegetables (mostly onion, garlic and tomato, then green bell pepper or carrots depending on the cook) on their stock, bay leaves and parsley. In the area of Cadiz they make a variation of this dish sautéeing the veggies rather than boiling them on the stock, and the result is a yellow stew they call Pescado en Amarillo – Fish in Yellow, as opposed to the Fish in White soup we discussed. 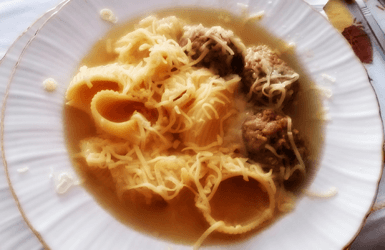 This very popular Catalan recipe usually cooked for Christmas lunch consists of a tasty broth based on vegetables, legumes and different kinds of meat and bones, slowly boiled for several hours and served with “galets”, a typical Catalan pasta, and “pilota”, a large meatball made of minced meat, egg, breadcrumbs, garlic and parsley that gets cooked inside the broth. When everything is served together, we call it “Escudella barrejada” (mixed escudella), and it makes a main course. But if the ingredients are served apart (broth with pasta and maybe the meatballs first, and then a big platter with the veggies and the meats), it makes a full meal of starter and main course. In such case each guest is allowed to choose what veggies and or meats wants to eat: it’s not compulsory to try everything. 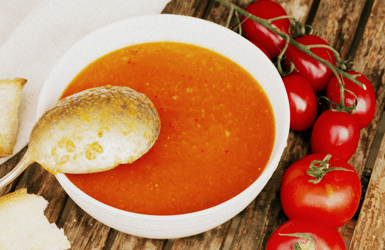 Gazpacho is a very refreshing Spanish tomato soup you’ve probably heard about before. If you are visiting Spain in the Summer you’ll find this light soup in almost any restaurant, served as a starter, and in many homes they’ll have it as a staple in their fridge to eat with the meals or as a pick-me-up. It’s original from Andalusia where olive oil and vegetable gardens are abundant. 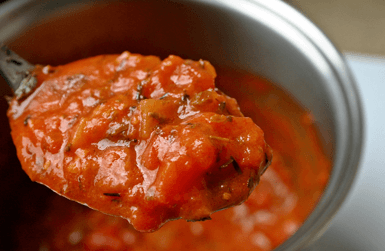 Gazpacho’s main ingredients are tomato, olive oil, vinegar and raw vegetables such as cucumber, pepper, onion and garlic. It can sometimes come with bread crumbles and diced veggies aside to be added as you please and add some crunchiness to the soup. So what about you? Head to the comments below and tells us: what are your favorite Spanish soups and why? WHAT’S THE BEST SPANISH RICE CASSEROLE? WEIRD SPANISH FOOD. ARE YOU DARING ENOUGH?